I went to Blue Haven Farm (www.bluehavenfarm.moonfruit.com) near Fergus two weeks ago and chose a gorgeous, fine-tempered white bird of the Columbia breed. (She's the one on the right.) I expected her to lay white eggs (and was excited by the thought of daily blue, white and brown eggs) but she pops brown eggs. I saw it as a great omen that her first one had two yolks! She has integrated well with Nog and Hermione--no fighting to sort out the pecking order. As for her name, I'm thinking of Harriet. I am from a small town and we have a fairly active horticultural group. I was wondering if you would be interested in coming to be a guest speaker. Do you have any idea where I can get pictures on the internet of aesthetically pleasing vegetable gardens that blend in with the urban landscape? 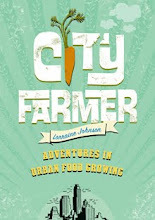 I'm doing a class presentation on your book 'City Farmer' and I need to show some photos. Anywhere you can direct me to? If you can let me know, that would be a huge help to me. I'm new to the site, so you've probably learned this since, but the colour of chickens' ears determine the colour of their eggs: Brown ears = brown eggs!